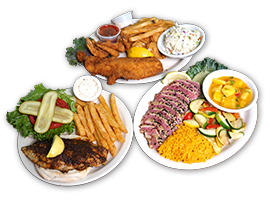 Serving traditional fare, local favorites and famous fish specials. Get directions to The Rod & Reel Pier or fill contact us with any questions. 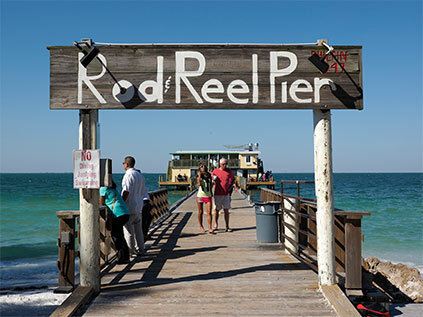 The Rod and Reel Pier is a one of Anna Maria Islands hidden treasure dining experiences. 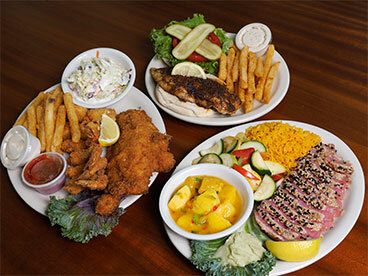 Tucked away on the far North end of Anna Maria, it is a "Little Bit of Old Florida" serving traditional fare, local favorites and famous fish specials since 1947. The Rod & Reel Pier is a two story, newly renovated restaurant, directly out on the Gulf of Mexico. Casual Dining for the whole family to enjoy up stairs either seated inside or out on its quaint covered outside deck gives a one a true Old Florida experience. The downstairs is a casual unique bar, serving beer and wine. A island favorite too many locals and travelers for years. The Rod & Reel serves Breakfast, lunch and dinner and your sure to be able to catch sunrise or a beautiful famous Florida sunset while eating from a great selection of its menus. To top the wonderful quaint dining experience, bring a fishing pole, for a small fee, and fish right off its dock and walkways. Spectacular view of the Gulf of Mexico, Anna Marias beautiful beaches and the Sunshine Skyway Bridge are all waiting for you to enjoy in a relaxed atmosphere that is unforgettable. Copyright © 2019 The Rod and Reel Pier. All rights reserved. | Online marketing by Webtivity Designs.